HTC One Mini release date: Where can I get it? The world's best mobile phone has been through the shrinker and out the other end has popped the HTC One Mini. Classy and compact, the Mini houses a 4.3-inch 720p display, dual-core Qualcomm Snapdragon 400 processor with 1GB of RAM, and 16GB of internal storage. Right now, the phone is expected to arrive on shelves in August and we've been told it will likely be available for free on contacts from £25-£27 per month. Phones 4U - Old faithful Phones 4U confirmed that it will be making the HTC One Mini available when it lands later this year, although it isn't giving any details beyond that for the time being. O2 - O2 took to Twitter to announce that it would also be stocking the HTC One Mini. "You WANT? We GOT. HTC One Mini, coming to O2 soon". That's solid confirmation, right there. It's yet to confirm pricing and tariffs, however. Vodafone - The big red network told us that it will be getting the Mini, and we can expect it to be offered from August. Vodafone also confirmed this over on its blog, in case you needed any reassurance. EE - As the HTC One Mini is 4G capable, it's good news that EE has said it will be offering the handset. It's currently not offering any details on pricing of date of availability - but hold tight, as we're sure to hear more soon. 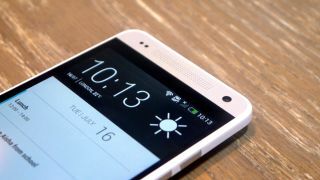 Unlocked-Mobiles - The web retailer has revealed when it expects to have the HTC One Mini in stock and August 12 is the lucky date. Available in black and white, Unlocked Mobiles reckons the HTC One Mini price will be £364.98, SIM-free.